What Are the Health Benefits of Plantains? Writer and editor. World traveler. Plantains look similar to bananas, but they're drastically different in flavor. Bananas are smaller and much sweeter, while plantains have a starchy consistency and taste. But because of their similar look, plantains are often referred to as cooking bananas. Commonly used in Caribbean and South American cuisines, plantains are a versatile carbohydrate source and are full of fiber, potassium and other vital nutrients. Read more: Do Over-Ripe Bananas Still Have Nutritional Value? When it comes to digestive health, nothing keeps things moving like fiber, and you'll find plenty in plantains. One cup of plantains contains 4.6 grams, or 18 percent of your recommended daily value. On the downside, this nutrient-rich fruit contains 62.3 grams of carbohydrate per one cup serving. That’s something to consider if you are monitoring your carb intake. Thankfully, plantains also have tons of fiber, which slows the release of sugar from carbs so it moves more slowly into your system. The Joslin Diabetes Center recommends that people with diabetes choose fiber-rich carbohydrate sources, because they make you feel fuller longer. If you want to incorporate plantains into your diet, make sure the savory fruit stands in for your carb portion if you are following the United States Department of Agriculture’s My Plate Food Plan. If you're following a low-carb diet, plantains can still be incorporated responsibly into your diet. There 930 milligrams of potassium in a 1-cup cooked serving of plantains, accounting for 27 percent of your recommended daily value. Potassium is an electrolyte, and is especially beneficial for those with blood pressure issues. It fights the good fight against sodium, which is present in unhealthy quantities in many Americans' diets. Not sure which method of cooking is best? 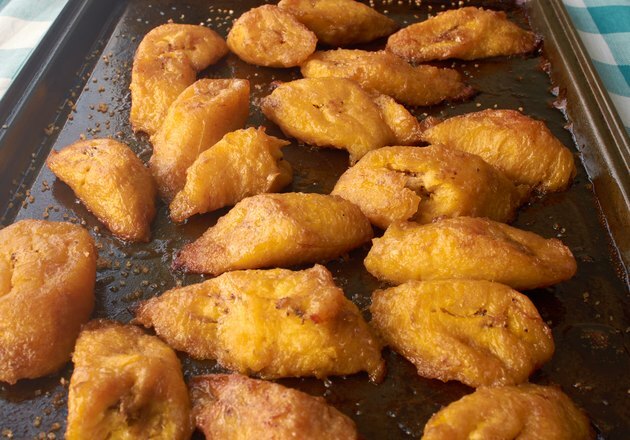 Boiled plantains might be the way to go because you're not adding any unhealthy ingredients. The Harvard School of Public Health reports, plantains and other types of bananas have historically been heralded for their easy-to-digest properties. Once commonly part of the BRAT diet (bananas, rice, applesauce, toast,) a diet that was once widely prescribed to those with suffering from diarrhea, or other stomach issues. In particular, the resistant starch found in plantains may also support gut healing. Plantains have been used for centuries not just as food, but also as a topical healing aid to treat dog bites, and as a remedy to treat ailments such as high fevers and the flu. They're still used in traditional medicine today. Dr. Edward Group, MD, told Global Health Center that research conducted by the German Commission E approved the use of plantain leaves for use in cough medicines. When cooked properly, plantains can be a great addition to any diet, but plantains do have disadvantages. Watch out for unnecessary sodium and fat that may come with different preparation methods. Plantain chips are often sold and packaged as an on-the-go snack. According to Nutritionvalue.org, a typical 100 gram serving of plantain chips can have as much as 30 grams of fat, or 46 percent of your recommended daily allotment, and 64 grams of carbs, which is about 21 percent of the total amount of carbs you should eat in a day. Livestrong: Do overripe bananas still have nutritional value? United States Department of Agriculture: What Is MyPlate? Livestrong: Are Boiled Sweet Plantains Healthy? Livestrong: What Are the Disadvantages of Plantains? Why Should Plantains Be Cooked Before Eatinng? What Are the Disadvantages of Plantains?